Convert waste cardboard, plastic and paper into dense bales, reducing volume by as much as 90%. Easier to handle and less costly to transport! Compaction equipment to reduce the volume of empty cans, drums, oil filters, bottles and general waste. Crush the cost of waste disposal! Take the strain out of wrapping pallets! Wrap to a consistently high standard, improve efficiency and save up to 60% on the cost per pallet wrapped. A complete range of quality packaging products for industry, business and individuals. Order online, by telephone or call in to see us! Orders are usually dispatched within one working day of receipt of payment, for delivery on a next-day service. The Agritel Online shop is open 24 hours a day, 7 days a week, providing better service than ever to our busy customers. Online ordering, secure payment and efficient shipping methods enable us to keep prices low. We specialise in packaging machines, industrial packaging, waste compactor systems and provide a whole host of related products and services to assist with packaging and baling for a range of commercial industries. Browse through the site to learn more about the full range of products we offer and how they can help to save your company time and money. We can help with industrial packaging supplies for your business, no matter the scale or size. We have a range of solutions for pallet wrapping including machine stretch wrap and hand stretch wrap to ensure your deliveries reach their destination in pristine condition. 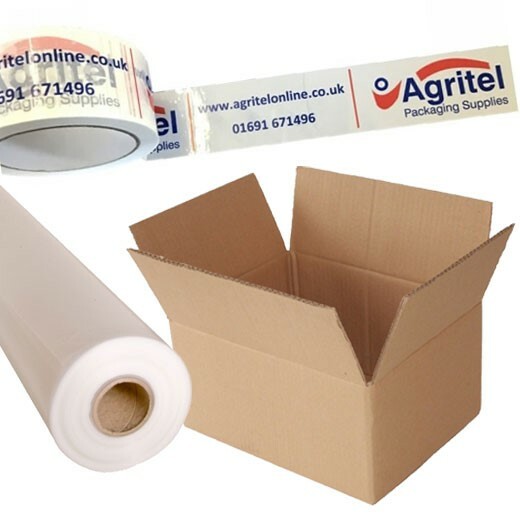 We also supply a range of industrial packaging items ideal for individual orders or packaging small to medium batches of stock including shrink film, bubble wrap, boxes for shipping, polythene sheets and bags and hotmelt glue guns. To improve loading times and durability of loads when travelling, we supply a range of packaging machines including pallet wrappers for industry. Pallet Wrappers provide a quick, safe and cost effective alternative to traditional hand wrapping methods. We believe in pallet wrappers so much that you can even arrange a one week trial at your premises to view the benefits first hand. Read more about our featured packaging machines including semi-automatic pallet wrappers, and power pre-stretch pallet wrappers and find out how they can increase your productivity. We also sell a wide selection of waste compactor models including waste balers and crushers. Our choice of waste compactor systems are designed for optimal results when compacting specific waste products including drum crushers, oil filter crushers, bin press and bag press, bottle crushers and other waste balers. Helping to keep your work place safe, tidy and environmentally friendly while also saving you time and money, our waste compactors are there to help you achieve your full potential. We also offer a special local service with free delivery and friendly customer support. “Agritel recommended the drum crusher along with a price and delivery date at the same time; the order was placed and the crusher arrived on time. We used to crush drums with a digger; the drum crusher is a faster and safer method and also crushes the drums flatter, allowing us to get more scrap in the skip hence reducing the transport costs. Copyright © 2008-2019 Agritel | Packaging for Industry and Business. All Rights Reserved.